The Neptune bunk bed is fresh and versatile. Giving you a single and a small double sleeping space. See our mattress recommendations below! The Neptune bunks are not your typical set of bunk beds. The top bunk is a single (3ft/90x190cm) whilst the bottom bunk is a small double (4ft/120x190cm). 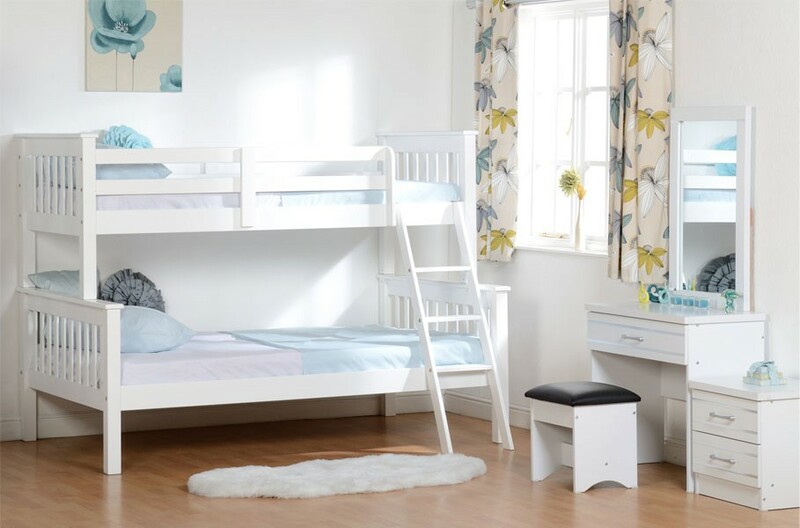 These bunks are ideal for siblings who are perhaps of different ages or for when you have a sleep over. It is also possible to split these bunks in to separate beds if needed in the future. These bunks have a classic design with a clean, fresh, white finish, making them highly versatile. Perfectly fitting in to a variety of different rooms and coordinating perfectly with existing décor. Strong and sturdy constructed from pine and finished with a neutral white painted finish. These bunks will last the test of time. To remove any marks try a damp cloth before resorting to chemical cleaners. When moving your bunks it is always best to lift rather than dragging or pushing as this could cause structural damage in the long term. This Triple bunk bed is delivered flat pack so self-assembly is required. The necessary instructions and fixtures are all included. As this is a large item we would recommend two people for safe assembly.